April 2, 2015 | 8:30 a.m.
Students assembled their vehicle for the scrambler event. The vehicle is powered by a falling mass and designed with a built-in brake; it must stop as close to the wall without breaking the egg attached to the front. 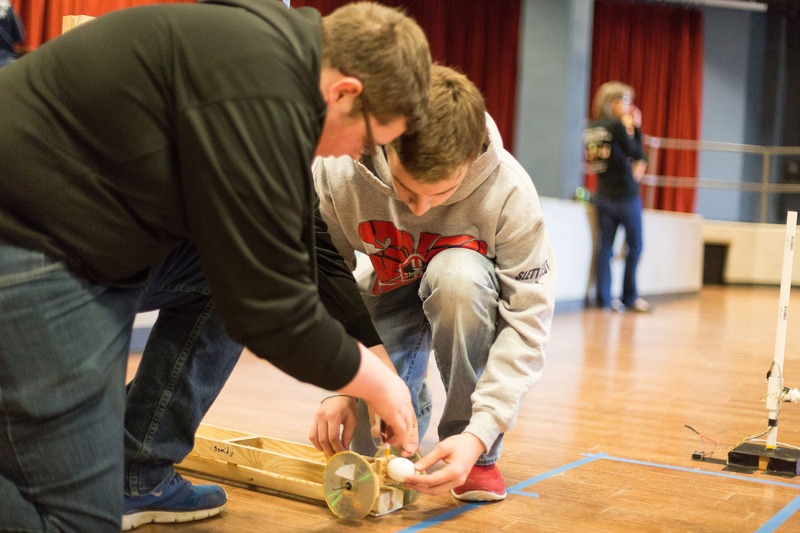 Bethel recently hosted the 2015 Minnesota State Science Olympiad Tournament. The top 30 high school teams from the organization’s regional events were invited to the state tournament, which included more than 375 students and their teachers. Multiple areas of campus, including every science lab space, were venues for the 23 science, technology, engineering, and math (STEM) events that ran most of the morning and afternoon. The events covered the full range of STEM activities from engineering as well as life, physical, and earth sciences. Bethel Assistant Professor of Chemistry Matthew Neibergall is the director for Division C (high school level) with the Minnesota State Science Olympiad. “This event is such a blast,” he said. “The kids continue to impress me with their results of the events.” For example, Professor of Physics Keith Stein led the bungee drop event in Brushaber Commons. Students were given a bungee cord, a weight, and the height of the drop point. They then had to calculate how much cord to use to be able to drop the weight and get it as close as possible to the ground without it touching. “The winning team came within one centimeter of touching the ground. That’s less than half an inch. You really can’t get much closer than that,” marveled Neibergall. Many were involved in running events, setting up, calculating scores, and more. 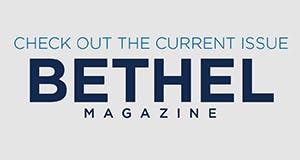 Volunteers included Bethel math and sciences faculty, doctoral students from the University of Minnesota, employees from medical device companies, local high school teachers, former Science Olympiad competitors, and representatives from the Minneapolis Model Airplane Club. About 30 current Bethel students from the math and sciences also volunteered. A group of them led “Minute to Win It” games for the high schoolers in Benson Great Hall while final scores were being tabulated before the closing ceremony. The Mounds View team earned the top spot overall, earning them a spot in the National Tournament at University of Nebraska-Lincoln. Wayzata placed second, Eastview of Apple Valley placed third, and Rochester John Marshall came in fourth. This was the second year Bethel hosted the Olympiad and Bethel will host it again next year.